Attract small songbirds and add charm to your garden! 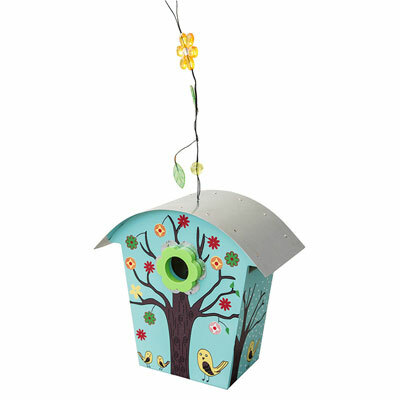 This whimsical birdhouse combines style and function. Each of its sides, painted with non-toxic paint, depict one of the four seasons, and the galvanized hanging cable is embellished with a glass flower and bead. Lightweight and durable, the house is constructed of exterior ply-board and has a galvanized steel roof that overhangs all four sides. Adding to its functionality is a cleanout door on the back of the house, as well as ventilation slots. The 1.25" entrance hole will entice small songbirds such as wrens and chickadees. 10"H x 9"W x 5"D.